Shelters Reach Capacity In Cold Weather As Homeless Population Rises The population of people who are homeless increased for the first time since 2010, according to the Department of Housing and Urban Development, and many shelters are having to turn people away. A man rests on top of a subway vent grate as a tourist walks past in Washington, D.C., on Jan. 5. Homeless shelters across the country are being strained by frigid weather and a population of people who are homeless that is up for the first time since 2010, according to the U.S. Department of Housing and Urban Development. Despite "code blue" policies that are designed to bring more homeless people inside during freezing temperatures, shelters are reaching capacity and being forced to turn people away, says Nan Roman, president and CEO of the National Alliance to End Homelessness. "Thirty-five percent of people who are homeless are not sheltered," she tells Here & Now's Robin Young. "We have about 550,000 homeless people but only about 275,000 emergency beds. So this is something that causes issues when we have these kind of serious cold snaps." Even if there is an available bed, sometimes people face barriers to entry such as ID requirements, health issues or if they're under the influence of alcohol or drugs, Roman says. Others would rather stay on the streets than go to a shelter because they can be dangerous places riddled with drugs, theft and bedbugs. 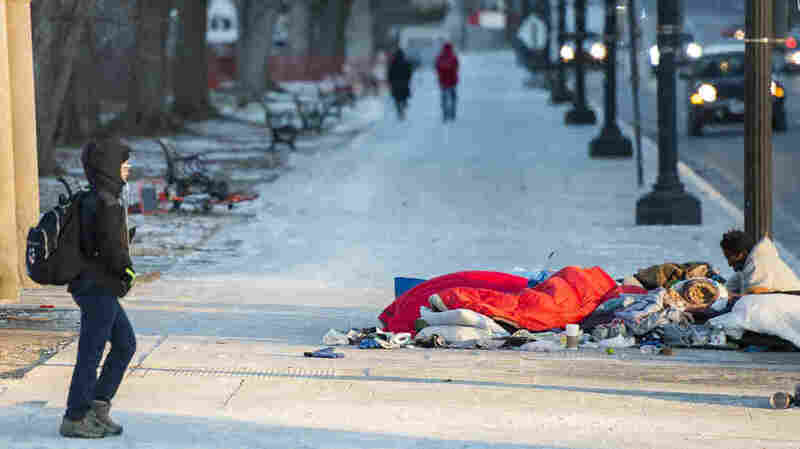 As a result, the National Coalition for the Homeless estimates nearly 700 people experiencing or at-risk of homelessness die from hypothermia each year. "Shelters really do need to lower their barriers, and we need to support them to do that so that there is a bed that's appropriate for every person," Roman says. "We just cannot be leaving people on the streets when it's cold or when it's not cold." But that's exactly what happens across the country, and when ordinary citizens or activists try to help by opening their own homes to people who are homeless, like Greg Schiller of Elgin, Ill., they are told by city officials to shut down. Schiller, who has worked with the suburban Chicago-area homeless community for years, says he started hosting about 10 to 15 people in his basement — setting up cots, sleeping bags and a portable toilet outside — because the main homeless shelter isn't always open. "We have two main homeless shelters, and then we have a crisis center that's for typically for women and children," he tells Young. "The main shelter — and I believe it's because of their funding and their insurance — they've got some restrictions that will prohibit people from entering," such as residency requirements, intoxication and mental illness. City officials told Schiller it was unlawful to create a makeshift homeless shelter inside his home, claiming it was a zoning and public safety issue, Schiller says. The two sides are now working together to combat the issue. "They do realize that there is a gap, and subsequently because of this gap people are being left out on the street, and they want me to work with them for that change," he says. Despite the current strength of the U.S. economy, homelessness is rising in places with inflated housing prices, especially in big cities on the West Coast, Roman says. "Homelessness is really driven by the cost of affordable housing primarily, and housing costs are way up relative to incomes for poor people," she says. Schiller says he will continue working with city officials to help ensure people aren't left out in the cold. He says it's important to be patient with people who are homeless in order to help them recover. "Meet them where they're at and stay with them," he says. "Develop a relationship with them — a real relationship. Take a vested interest in that individual and walk them, however slowly they need to go, toward recovery."